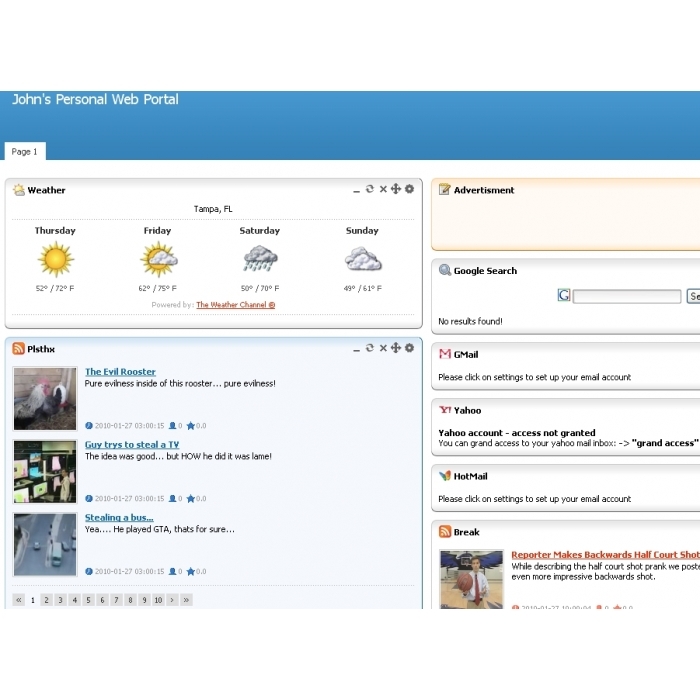 Page-flakes offers you a web desktop-like portal with a set of tools which helps you organize, track and store a large amount of information such as RSS Feeds, personal notes, organizer and a lot more. Visitors can add just about any content from the web. 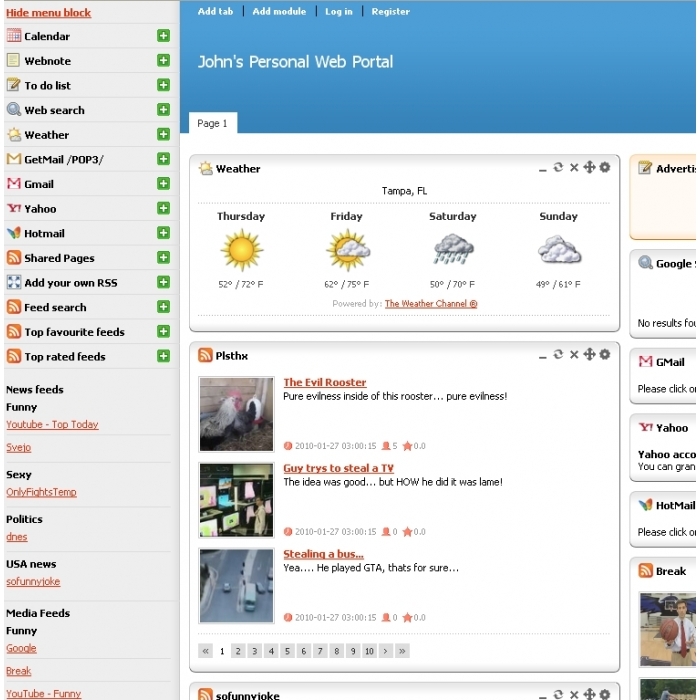 Imagine having everything on one page - daily news you read, emails, weather, funny videos and images, etc.You can add unlimited number of RSS feeds and gadgets. add multiple tabs. Each tab can hold up to 3 columns of modules. add modules in each tab. minimize, move and close modules. change common (like module title and color) and module-specific settings. register so they can save their pages. view the list of registered users. view the list of site's RSS feeds. edit and delete RSS feeds. add new RSS feed URLs. make up to 6 feeds default so they can be displayed on the main page by default. manage categories for RSS feeds. These are modules which users can choose to use in their workspace. The system can be extended by creating/writing additional modules. It is an event calendar where users can mark events (as in a personal organizer). The main actions are view/add/delete events. This is an alternative for the yellow sticky notes from your desk. Users can store text information inside them and the text will always be visible. Easily create a to-do list with check boxes so users can mark the items. Using google.com search engine you can quickly search the web without leaving the site or the tab. Just type in what you're looking for. Common weather forecast module which gives users information based on the location they've entered. If you have an email account which supports POP3 (most email services do) then you can set this module to check your inbox and show your messages. Same as GetMail module, but this one checks and gets only messages from your Google mail account through Google API. You don't need to enable your POP3 on your Google account. Same as GetMail but this module uses Yahoo API to check and read your email account. Same as GetMail but for Hotmail servers. The method of retrieving the data is the same as GetMail - POP3. Registered users can make their page public. This module lists available pages which users can view and clone for themselves. If the feed you want is not in our RSS feeds list, you can manually add one. Be aware that the RSS feed you want must be a standard one without custom fields. Search feeds saved on the site using just a keyword. Shows a list of top favorite feed items. Shows a list of top rated feed items. 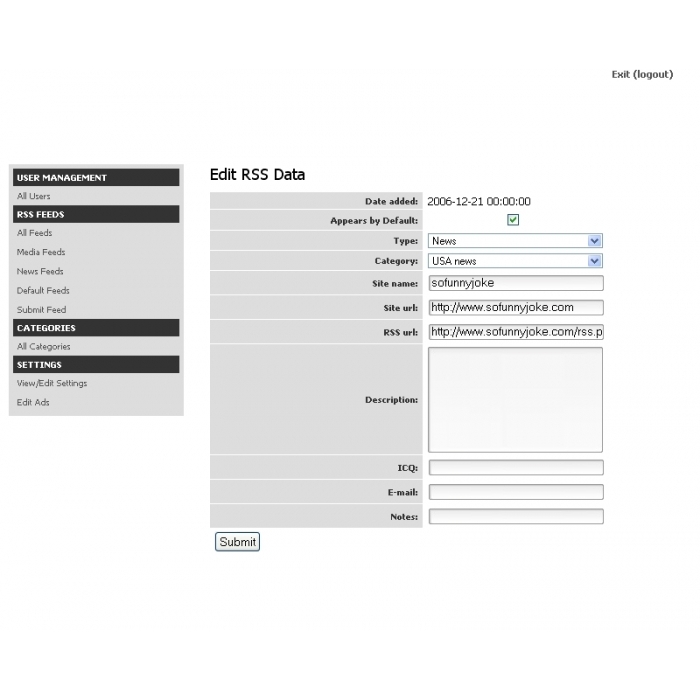 The website has predefined RSS Feeds which can be controlled from the admin section. Users can select them from a list and can add them to their page.